I think this Bangkok street stall is as photographed as the Grand Palace! If you’ve spent time in Bangkok, or even if you’ve just visited for a few days, you’ve undoubtedly passed these street food stalls just outside Central World shopping center (เซ็นทรัลเวิลด์). I’ve eaten here numerous times, but have just failed to write anything. So finally, here it is, one of the most popular and possibly the most easily accessible street restaurant in all of Bangkok: Ratchaprasong Thai Food (ราชประสงค์ ไทยฟู้ด). 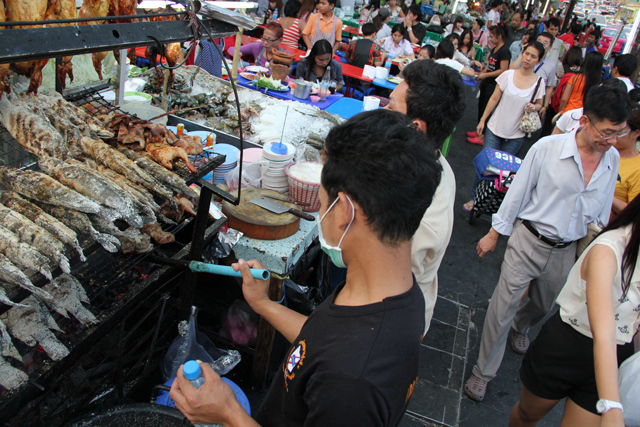 Thousands of pedestrians stop to admire this Thai street food! 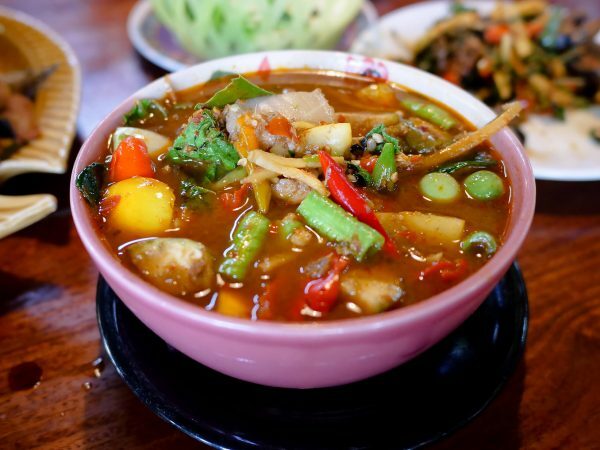 Located in one of the busiest locations for foot traffic in all of Bangkok, the series of Thai street food restaurants just outside of Central World shopping center, attract the masses. 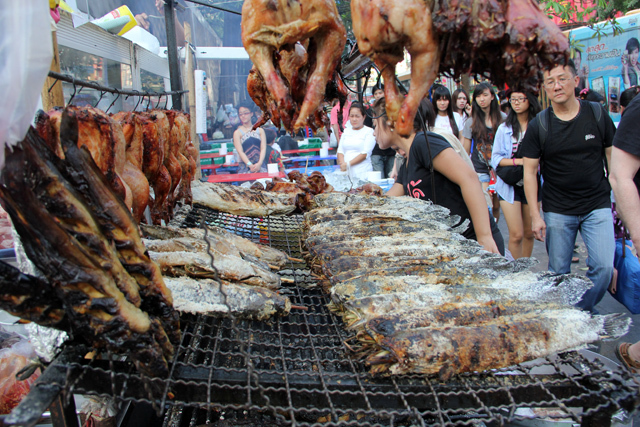 Everyday thousands upon thousands of tourists and locals as well make the trek from Siam to Pratunam market (video) area, passing, taking photos, and admiring the jaw dropping grills on display. 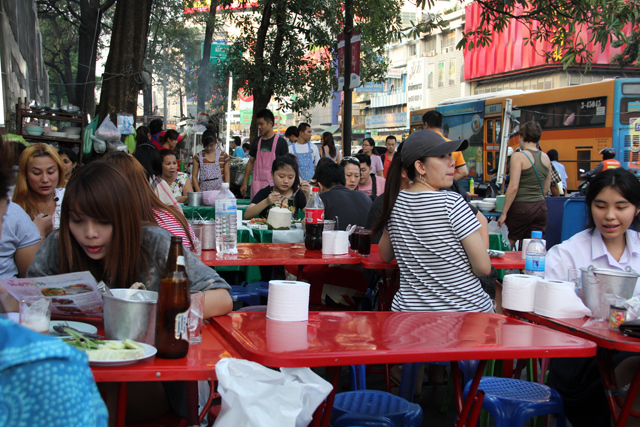 During the daytime, the section of sidewalk is filled with clothes vendors and small street food stalls, but starting at 5 pm each day, the scene shifts to much more impressive and tasty things. There are about 5 or so restaurants that take control of the sidewalk, all of them serving just about the same menu. I personally go to the first stall closest to Central World, known as Ratchaprasong Thai Food (ราชประสงค์ ไทยฟู้ด), mostly because the owner and the crew of staff are all extremely friendly. Among the selection on the menu are grilled duck beaks. They don’t look that good, but they do make an exotic, and pleasantly tasty Thai dish. How could anyone not want to stop here and eat? 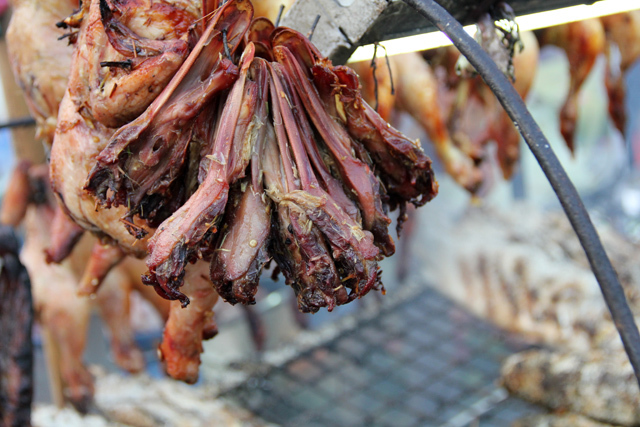 From the appearance of the street stall, one may assume that the chickens have been cooked by electrocution. However, they are most likely just grilled! 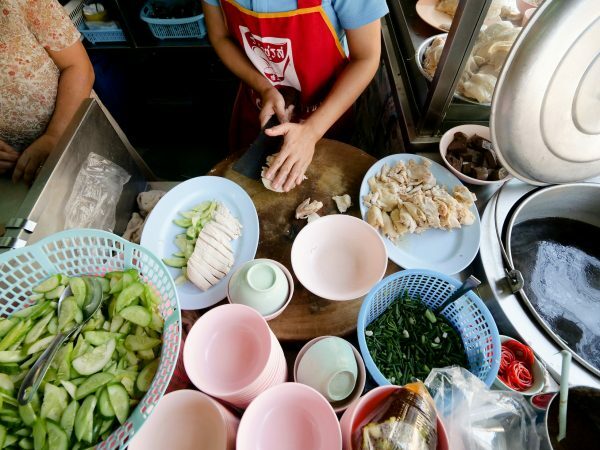 Classic Bangkok fold up tables are lined up along on the sidewalk cafeteria style. It’s not exactly a peaceful dining experience; Traffic roars in all directions, pedestrians never stop, and both the heavy smoke from the grills and the fumes from the vehicles makes the air far from fresh. 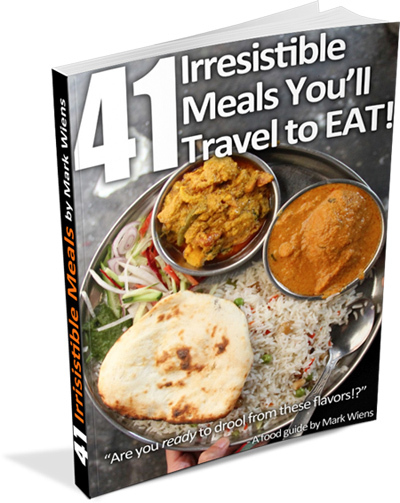 People tend to eat and go quickly, it’s fast paced street food! 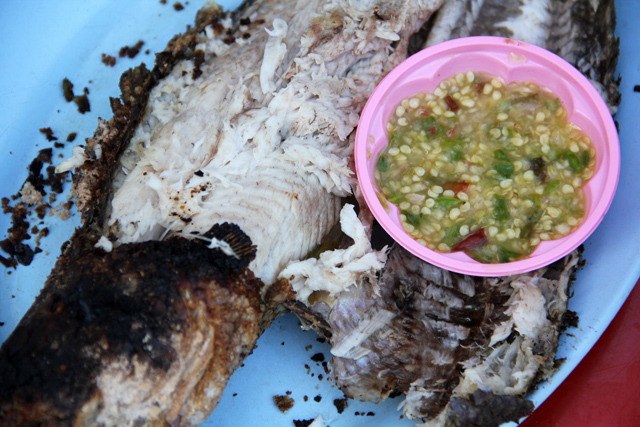 The main attraction for me is the grilled snakehead fish (pla chon pao ปลาช่อนเผา). They are by all means not the most attractive creatures in the world, but what they lack in their looks, they sure make up flavor wise. 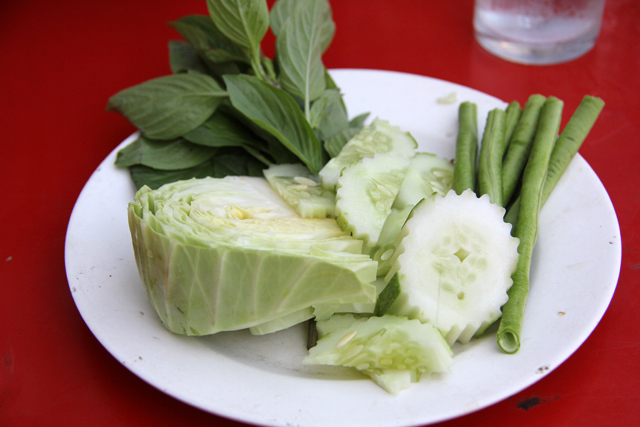 Like all Isaan restaurants, you’re first served a plate of raw vegetables: cabbage, long beans, cucumbers, and sweet basil. We went a little light, just ordering the basics, as I was most interested in eating a snakehead fish. We also got a half a grilled chicken (gai yang ไก่ย่าง), which in my opinion was just a little dry (perhaps it got electrocuted? 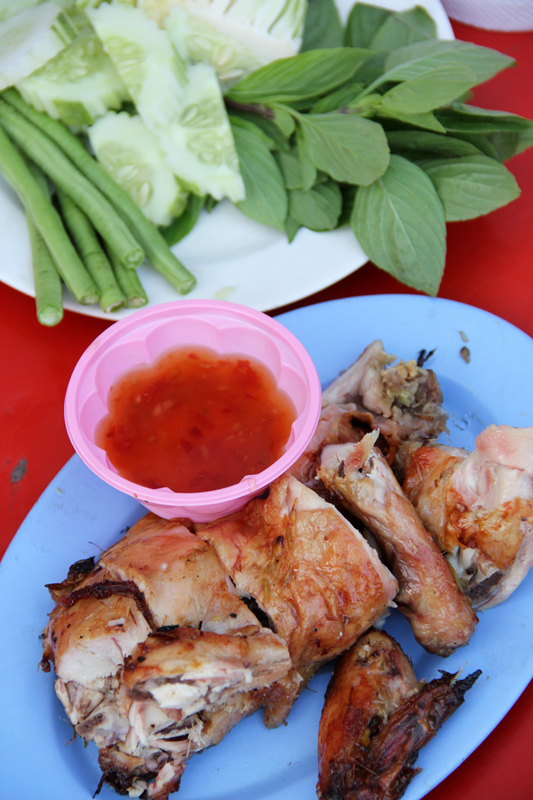 ), not as good as the chicken from Sabai Jai Gai Yang. 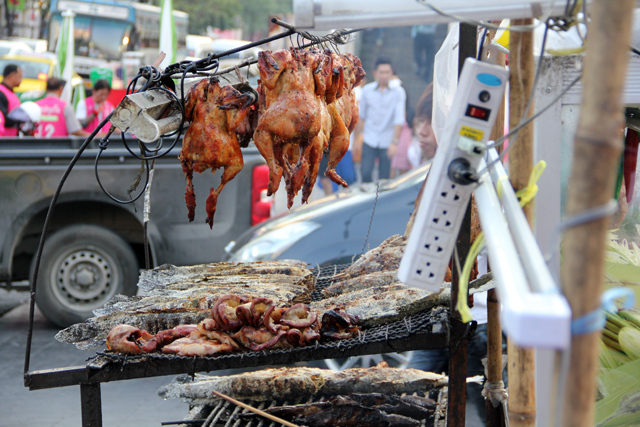 That’s just sort of the luck of the draw when you eat Thai street food – I’m sure other chickens on the skewer were more juicy and moist. Nevertheless, it was a good and meaty chicken for those that aren’t interested in the grilled fish. 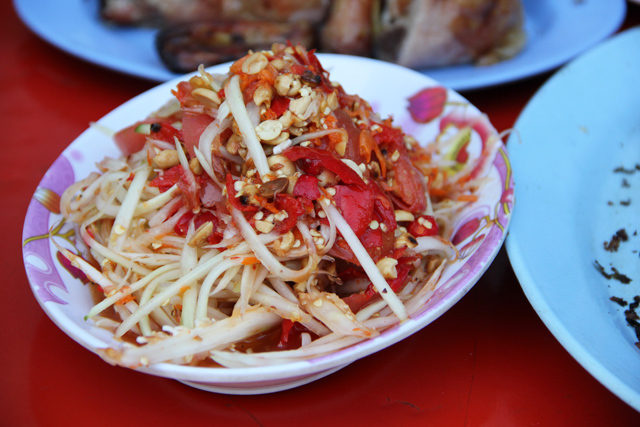 Som tam (green papaya salad ส้มตำ), is of course a must. While I wouldn’t rate it as good as the som tam at Silom’s graveyard street stall, it’s pretty good. Another great thing about Ratchaprasong Thai Food (ราชประสงค์ ไทยฟู้ด) is when you ask for spicy, they won’t fail to deliver. Hot means hot – no joking! Finally to the main attraction, the roasted snakehead fish (pla chon pao ปลาช่อนเผา). 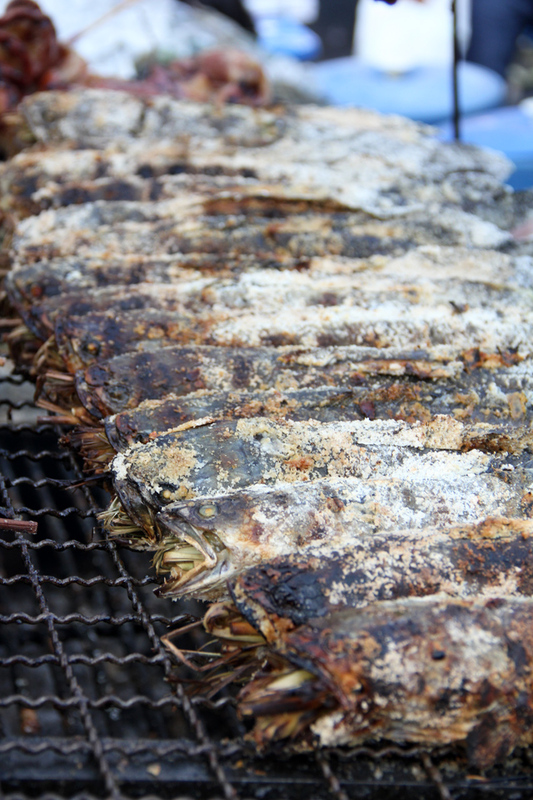 Stuffed full of lemongrass and rolled in salt before being slow roasted over the fire, the fish was excellent. It was moist, flaky, and the sauce was particularly wonderful. 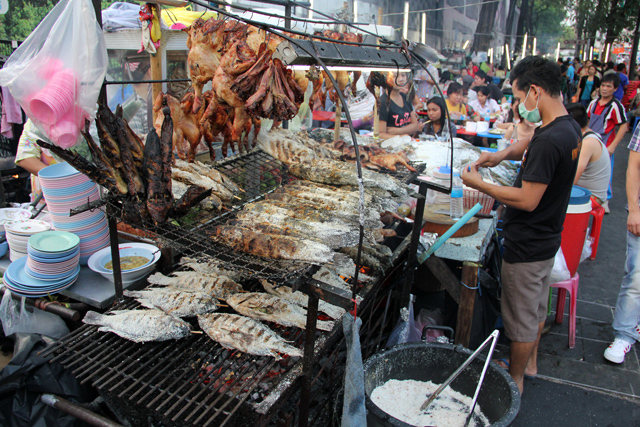 Grilled fish and sticky rice is the best reason to go to the street food stalls outside of Central World! 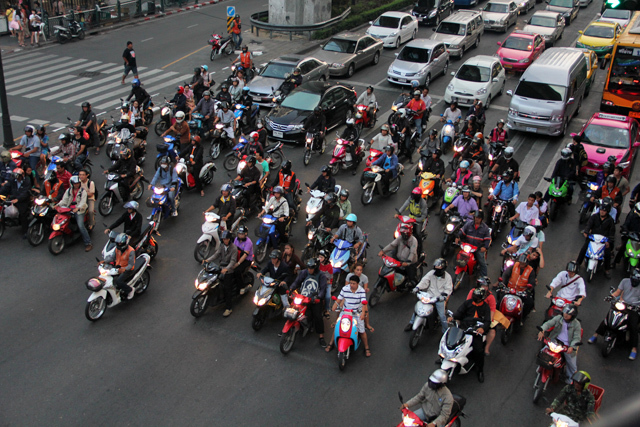 Here’s a quick shot of the traffic at 5:30 pm in Bangkok at Ratchaprasong intersection. And here’s one last photo of the busy pedestrian sidewalk that flows right next to the hot grill. Here’s the video to go with this restaurant… I think you may be able to smell the roasting fish from the video! 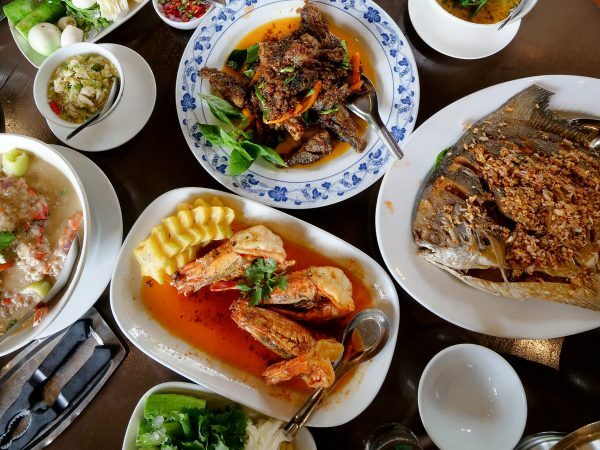 Part of any street food dining experience is the ambiance, and the stalls outside of Bangkok’s Central World offer an extremely fast paced environment for a meal. Like any business, it’s all about location, and they perhaps have the best Bangkok street food location. 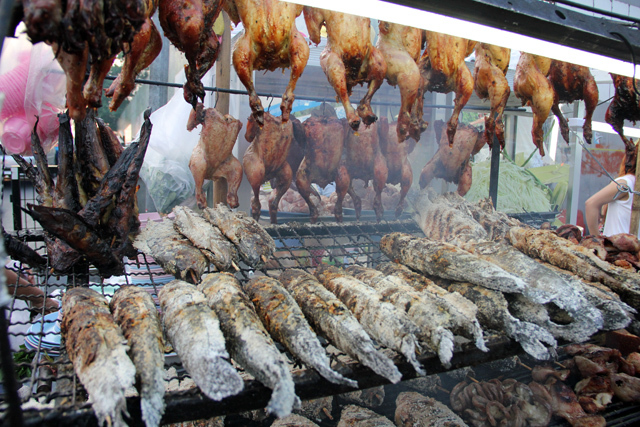 Also, their trophy grill packed with slow roasting creatures is simply irresistible, a Bangkok attraction in and of itself. As for the food, it’s not the best in Bangkok, but it certainly is tasty Thai street food that’s very worth eating, and extremely convenient. Like I mentioned above, there are about 5 different stalls to choose from, but I prefer the very first stall, which is closest to Central World. The staff is nice and friendly, and I think the food looks the best. Take the BTS to Chit Lom station, walk towards Ratchaprasong road and cross the street over to Central World. Walk all the way past Central World on your way to Pratunam, and it would be impossible to miss these Thai street food stalls (only begin at 5 pm). Finally, here’s the full video of the restaurant, which you’re going to love (just press play below)! Dude these stalls are gone. The organised stalls that replaced them are terrible. One of the worst som tams I have ever eaten. Be warned. Ratchaprasong Thai Food (ราชประสงค์ ไทยฟู้ด) has moved. Can you advise me the new address? Thanks to this advice I ended up going twice on my recent stay in Bangkok. This is such a good stall and the people really are very friendly. Does anybody know the name of that spicy green sauce they serve with the fish as this stuff is dynamite. Hi Greg, from what I know they still exist, but I haven’t been down there in a few months, and things are changing pretty quickly so I’m not certain. Do you by any chance know if it was a Monday when you walked past last time? They might be closed on Monday. It must have been a Monday that we were there, didn’t think about that. I’ll have to visit in December when I’m back and confirm. :) Thanks!! what a great experience having Dinner there … My mother was overjoyed eating such great Spicy and delicious food . She is … Since yesterday .. Now 71 and is Planning her next bangkok Visit this years November ! Hey Chris, this is great to hear, glad you and your mother enjoyed the food, and that you mother is planning another trip to Bangkok. Thank you for sharing! Looking for good/great seafood places that are not super expensive in Bangkok. Centrally located would be great but no matter where I should be able to find it. Fried fish, crab, shrimp etc…. Anyways I work for Srilankan Airlines. I am a big fan of this place for eight years. And I am flight attendant who flies to Bangkok often for eight years. I never miss trying out the fish, papaya salad here. I wanted to tell about this place to one of my friends who will fly to Thailand for first time. I just google to find out it’s name. I’m very thrilled to see this blog. It inspired me to open up my own blog in future about my passion about travel and food and wine I enjoy. I recommend about this street food stalls near central world. It’s the best in Thailand. I have a correction make. All the other six days it’s open after 5 pm. I went there on a Monday. I should mention about one more thing. The papaya salad is really good here. 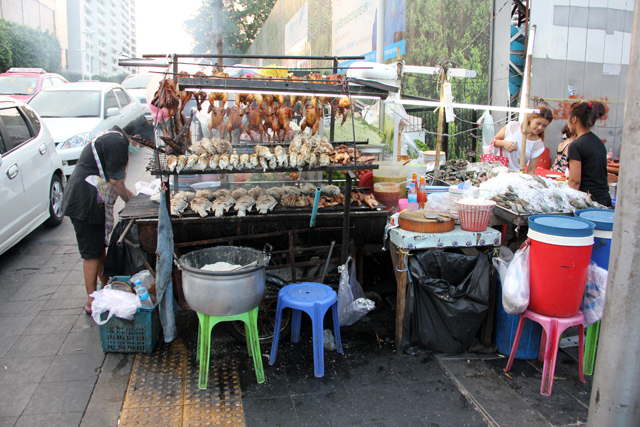 My favourite stall in this street food area is the first stall you get when you walk from central world. Tables are red in colour. 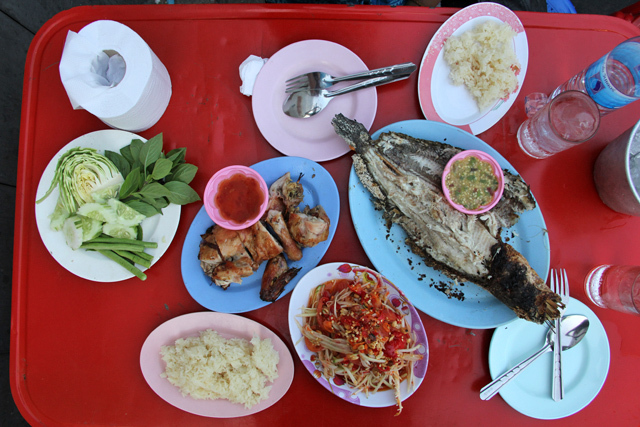 Singha beer (big), Papaya salad, Steam Rice, Snake Fish ( The long Fish ) and complementary vegetables cost only 320 Bath. Hey Bath, great to hear from you, thanks for sharing! Glad you love these stalls too. What airline do you fly with? Glad you enjoyed it Alex, oh yes… the Bangkok rats! Hey Mark, my girlfriend and I are staying just south of there for a month. We just found these stalls and they are indeed impressive but it was super packed and we didn’t eat this time. I want to just offer a quick correction on how to get there – the stalls and Central World are on Ratchadamri Road (the area is called Ratchaprasong district). Look for the huge Big C supermarket and the stalls are across the street and a little toward the canal. Hey Hans, great to hear you’re staying in BKK. Thanks for the correction, will get it changed.